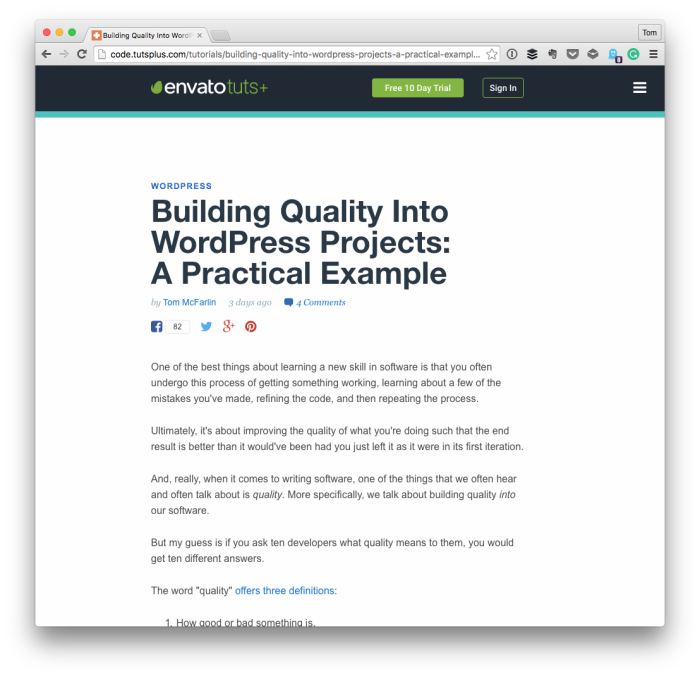 Building quality into WordPress projects is a topic that sounds a little subjective or maybe even a bit esoteric. To be honest, I think it certainly helps to have a level of experience in general software development as well as with the way WordPress does things, but it’s something that anyone can learn. I’d go as far as to say that many people who care about building quality into WordPress projects are people who are consistently learning new ways to go about doing so. Anyway, in a recent article for Envato, I cover exactly this. Before jumping into an actual example of what quality code may look like, I talk about the general definition of quality, how it applies to what we do in the context of WordPress. and then talk about how there’s a level of subjectivity (though there are some things we can all do). Whatever the case, “quality” can mean different things to different people. But I believe there are certain things that aren’t subjective with regard to WordPress development. Throughout the rest of the article, I use the wp_title function as an example of what a low-quality solution may look like and how a high-quality solution may appear. All of this came from an idea that someone shared with me some time ago. They said: “More lines of code does not mean more quality.” And I didn’t necessarily agree. If you’re someone looking to focus on building quality into WordPress projects, but aren’t sure what that means or how to approach it, then check out the article (and feel free to offer feedback in the comments! ).